One of my favorite things to eat are chocolate-covered cherries. I adore them. I love them. I would eat them night and day if they wouldn’t make me sick. My favorite are the liquid-filled Cella cherries, but I’ll eat any kind you give me. The other day, I was thinking about how much I love chocolate-covered cherries and decided to try to make some. But, because this is a fudge blog, I decided to make them with fudge instead of just chocolate. Another thing I love is bourbon, especially if there is a cherry in it. I love drunk cherries. So instead of just plain maraschino cherries, I decided to make my cherries decidedly tipsy before enrobing them in fudge. And chocolate. I decided to call them Cherry Bombs, following a rather alcoholic naming convention that I used in my Lemon Bombs. Perfect. Chocolate-covered cherries with a little kick. How did it come out? I love cherries. I love chocolate. I love fudge. I love bourbon. How could it not be anything but divine? Drain a dozen or so cherries and put them into a small container. Cover the cherries with bourbon. Cover the container with an air-tight lid and let it sit in the refrigerator for a couple of days, so that the cherries can soak up some alcoholic goodness. About an hour before you want to cover them in fudge, drain the cherries. Don’t lose a drop of that bourbon, though. You can sip on a cherry syrup-enhanced toddy as you make the fudge-covered cherries. Pat the cherries with a clean paper towel to remove some of the moisture from the surface. You don’t want to remove all of the bourbon inside the cherry, though, because you want it to mingle with the fudge to make a luscious fudge-bourbon chocolate. Make a batch of chocolate fudge. The base recipe will do, but you can make any kind you think would go best with the cherries. Let the fudge sit until it cools enough to handle safely. Use a melon baller or a small spoon and scoop out a ball big enough to cover a cherry. Get some good quality melting chocolate and melt it in a double boiler. If you are talented at melting chocolate in a microwave, feel free to do it that way. I don’t have that skill. 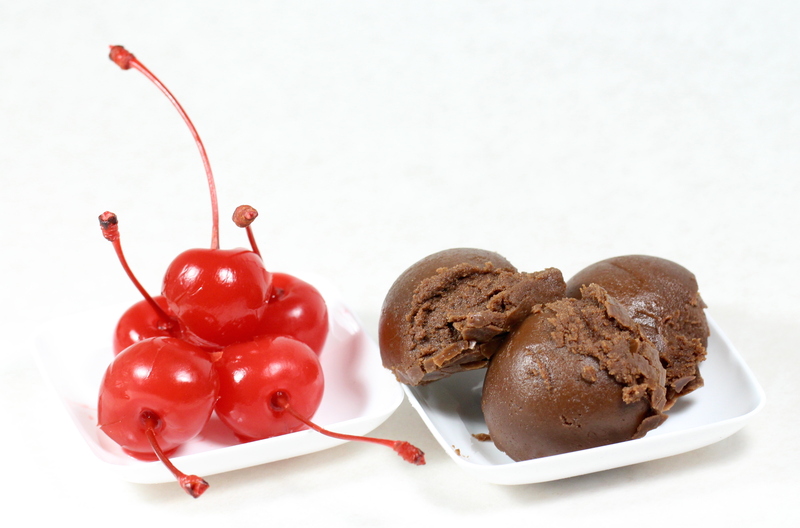 Dunk each fudge-covered cherry in the melted chocolate. If you use cherries with stems, make sure you cover the point where the stem meets the cherry. Let the cherries cool completely before eating. Store the cherries in a covered container in the refrigerator.